In 2005, in the middle of the etude project, I met with Dr Rainer Kahleyss, the owner of Musicaphon, to discuss further recording projects. Having done all these rather demanding etudes and no end of those in sight (in fact, I am writing this in 2012, just having finished the Grützmacher recording and thus the etude project), we talked about this and that, until Rainer asked the innocent question: "How about the Reger Sonatas?" I had to admit that I barely knew them and said I would look into the options. 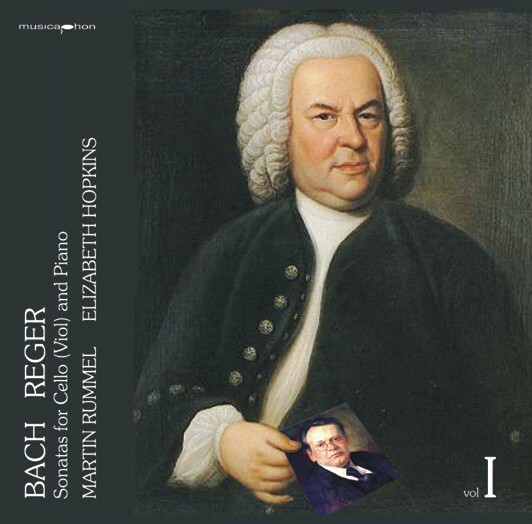 Being an organist and musicologist, he of course knew a lot of Reger's music and also its connections to the German Baroque tradition. The idea to combine them with Bach's gamba sonatas seemed rather obvious, because I was slightly hesitant to record those on a single disc with piano instead of harpsichord or organ. Having played them with various accordionists, I had rather envisaged recording them with accordion. Finding a pianist who would undertake this huge project seemed to be the next hurdle, but a solution was found quickly. Through the violinist Boris Kucharsky who I had met in Cologne where we both studied in the 1990s, I met Scottish-born pianist Elizabeth Hopkins when I lived in Munich. In the early 2000s, they gave a series of lecture recitals at Gasteig with the complete Beethoven Sonatas (which resulted in a remarkable CD series). Subsequently we played a few trio concerts, so I just rang Elizabeth up and asked her if she would do it. To my big surprise, she instantly agreed. I am not sure how often she regretted that instant agreement, as the piano parts of Reger's cello sonatas are nighmarishly difficult. Fistfuls of notes in rather frightening speed and a seemingly random harmonic structure that is very hard to understand, let alone memorize - which is exactly what you have to do just to be able to play the right notes in some passages because of very tricky jumps. I still admire her for making these piano parts sound transparent and logic, yet never an "accompaniment" but a real duo partner sound. Reger one day reportedly came to a restaurant and placed the following order: "Bring me two litres of beer and then one hour of Schnitzel."